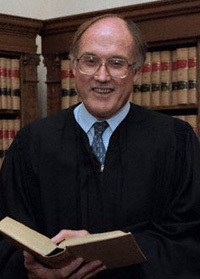 William Rehnquist: 8.5. I adore the $30,000 impeachment admiralty robe! Has a Supreme Court chief justice ever been this consumed with couture before? I imagine him alone at night with a bottle of Pinot Grigio, performing the complete score from HMS Pinafore. Bonus points for the jaunty Windsor cap. John Paul Stevens: 4. Chicks dig the bowtie. But majority opinion in FCC v Pacifica means he is unlikely to talk dirty in bed. Antonin Scalia: 7. "That's a spicy meatball!" This Italian stallion would have scored a solid 9, but I docked him one point for his poor showing in the Miss Congeniality contest, and another point for his too-selective use of stare decisis. Anthony Kennedy: 10. Three words: Lawrence v Texas. It doesn't get any sexier than that. David Souter: 5. Urban eroticism pre-empted by Yankee stoicism. Clarence Thomas: 8. The Malcontent thinks that whole "Long Dong Silver" business all might have been a bit of thinly disguised autobiographical projection. Steven Breyer: 3. Steven who? His blank slate of a tenure (not to mention his entirely forgettable appearance) is a metaphor for the presidency of the man who nominated him. But he gets a bonus point for not resorting to the comb-over. Gonzales=Secret Code for Hispanic Nominee? But could this actually be a tip-off that a Hispanic nominee really is on the way? 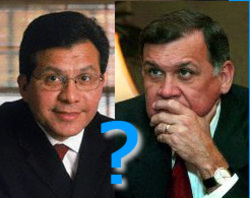 I tend to doubt that it will be Gonzales himself, given the hackles his potential nomination originally raised on the right. (See here, here, and here, for starters.) So I will keep my Martinez mini-boomlet precariously afloat. I think the chances of this president naming a nominee to the left of Roberts are virtually nil. But perhaps friendship and loyalty will trump the once-in-a-generation chance to steer the court hard to starboard. Q: Why Did the Cubano Cross the Road? A: To get to the Supreme Court (from the U.S. Capitol, that is). 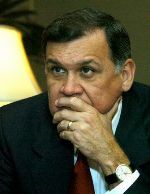 So will Sen. Mel Martinez become the first Hispanic Supreme Court Justice? The conservative Newsmax.com says a "good source" tells them that Martinez's buddy, a guy known as "the President," just might make it happen. If you think it's just idle speculation, remember that Newsmax also made the Roberts-for-CJ call weeks ago. Of course, this would demolish my Edith boomlet. But it doesn't take a genius to think that an "under-represented" group would be a shoo-in, following the nomination of a white male Chief Justice. Bush announces CJ nominee, and it's a familiar name. You read it here first ... maybe. I still think that means we'll see an "Edith" to replace O'Connor – probably Jones – with an outside shot of a Rogers Brown. My heart goes out to the Rehnquist family. The Chief Justice presided over remarkable times and did so with temperance and fairness. For now, Roberts sails through. Afterward, expect one of the Ediths. If it is Jones, this will get bloody. I am officially casting my non-vote for Anthony Kennedy for Chief Justice. And if it happens, I promise to eat a big dog turd on live television. However, some might speculate that Roberts may get the nod instead for the CJ spot. I think it is not entirely unfounded, and would probably be welcome.